Bank of America (BofA) announced its Q1 2019earnings, demonstrating that investments in its digital platform have been paying off in the form of increased engagement. BofA has been successful in finding new ways of driving engagement as mobile banking ubiquity in the US has made new users hard to come by. 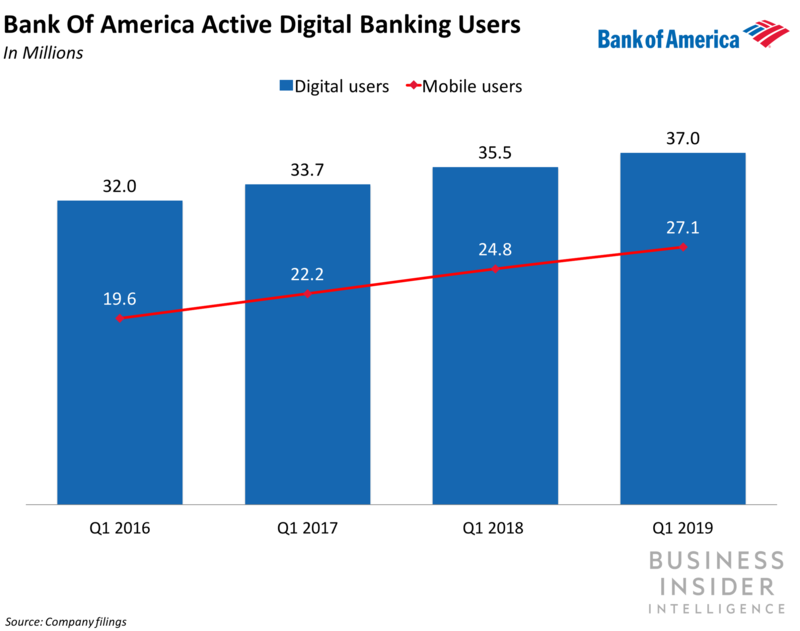 BofA counts 37 million active digital banking users, 27.1 million of whom use mobile banking: That’s a 9% annual increase in active mobile banking users, consistent sequentially with growth in Q4 2018. Still, it’s a slight deceleration from the 12% annual growth BofA saw in active mobile users in Q1 2018, when it counted 24.8 million active users. Despite that slight deceleration in user growth, BofA saw healthy engagement on its digital channels, with 1.5 billion mobile logins, up from 1.4 billion mobile logins in Q1 2018. And, notably, 51% of all digital sales came from mobile, up from 26% in Q1 2018. Erica, the bank’s in-app virtual voice assistant, performed well in Q1 2019. The voice assistant now counts 6.3 million users who have completed 39 million interactions. For context, Erica counted 4.8 million users and 32 million interactions in Q4 2018. Since launching Erica in May 2018, BofA has been adding new features beyond its initial capabilities of viewing and paying bills, transferring money between accounts, accessing card controls, and sending transfers through Zelle, the bank-based peer-to-peer (P2P) service. In Q1, BofA added the ability to flag recurring charges and receive reminders about bills through Erica, for instance. The firm’s expansion plans signal that it recognizes the significant role branches play in driving deposits. BofA still sees 80% of its accounts opened at bank branches, and its expansion plans signal that it recognizes how critical bank branches remain for driving deposits, even while also prioritizing and building out its digital capabilities.